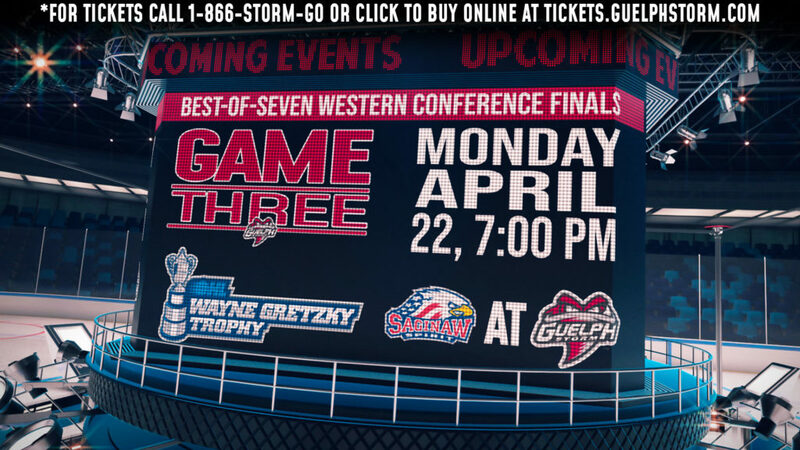 On Friday, the Guelph Storm invite the Ottawa 67s to the Sleeman Centre for the first and only time this season. The first game of the series took place last month in Ottawa. Both teams played strong, but Guelph came away with the win as Cam Hillis scored in overtime to win it 5-4. Hillis had 2 goals and an assist that game. After a season where they finished with 26 wins in 2016-17, the 67s are already at 24 wins this season with 15 games left. They sit 3rd in the East division with a record of 24-21-5-3 for 56 points. Ten points behind division leaders Kingston with 66 points. Austen Keating has been playing a key role on a young team. The Guelph native has 21 goals and 22 assists for 43 points this season and is tied for 5th in the league with 3 short-handed goals this season. He is 3rd on the team in points behind Sasha Chmelevski and Tye Felhaber. The Storm are continuing to fight for home ice-advantage for the playoffs. 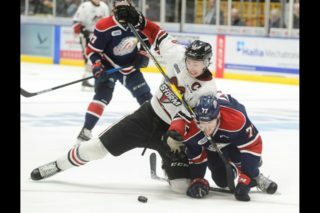 They are in a battle with division rivals London and Owen Sound, as well as Saginaw. They are all within 3 points of each other for the 4th spot in the conference, as Sault Ste. Marie, Kitchener and Sarnia have solidified the first 3 spots. Guelph is 3rd in the Midwest division with a record of 27-21-2-3, 3 points behind the London Knights. Look for forward Nate Schnarr to continue improving his offensive output. 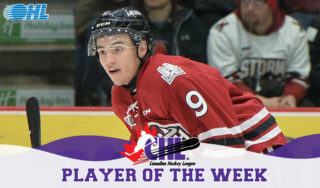 He was named the Storm’s player of the week last week recording six points in three games.So far this year, Schnarr has 13 goals and 20 assists in 43 games played. The Waterloo has recorded eight points in his last six games. This game will feature 9 players drafted to the NHL. 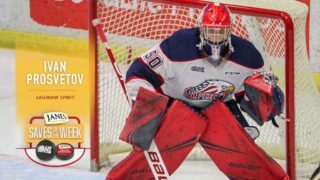 Guelph has 6 players drafted, while Ottawa has 3. 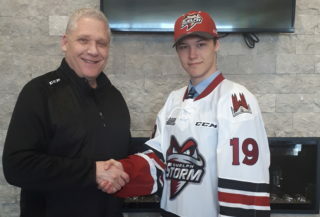 The 6 from Guelph include Liam Hawel (Dallas Stars, 2017, 4th round), Nate Schnarr (Arizona Coyotes, 2017, 3rd round), Alexey Toropchenko (St. Louis Blues, 2017, 4th round), Isaac Ratcliffe (Philadelphia Flyers, 2017, 2nd round), Dimitri Samorukov (Edmonton Oilers, 2017, 3rd round) and Mark Shoemaker (San Jose Sharks, 2016, 6th round). The remaining players from Ottawa are Sasha Chmelevski (San Jose Sharks, 2017, 6th round), Travis Barron (Colorado Avalanche, 2016, 7th round) and Noel Hoefenmayer (Arizona Coyotes, 2017, 4th round). This matchup will include 2 players who were selected top 10 in the 2017 OHL Priority Selection Draft, Guelph’s Tag Bertuzzi (2nd) and Ottawa’s Graeme Clarke (6th). Bertuzzi has been used in a limited role this season, though has been looking better recently, including a 2-assist night last week against Windsor. He has 3 goals and 8 assists for 11 points this season. Clarke has been used more offensively with Ottawa in is rookie year. He is a top 20 rookie scorer this year, with 12 goals and 9 assists for 21 points this season. Tonight’s game is sponsored by the Grain Farmers of Ontario. Stop by Gate #6 to meet an Ontario grain farmer and pick up your collectors set of the ‘Good in every grain’ farmer cards. Members of the Toronto Maple Leafs Alumni will also be at the game on Friday. They will be in Guelph as part of Leafs Nation Winter Week and partaking in many of the Storm’s game day promotions. 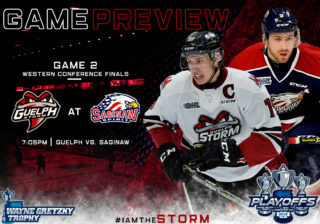 On Sunday, the Storm will play the first game in a back-to-back series against the Erie Otters. They will travel to Erie on Sunday before playing at home on Family Day Monday at 2pm. Family Day is not only a great opportunity to bring the entire family to the Sleeman Centre, but also to meet your favourite Storm players following the game! The Storm host the Erie Otters at 2pm in what has become an annual Family Day tradition at the Sleeman Centre. Once the game ends, more fun begins on the ice as fans with tickets to the game are welcome to get on the ice and skate around with their favourite Storm players. Each member of the team will be signing autographs, taking pictures and interacting with Storm fans. Fans are encouraged to bring their skates to the game, as only those with skates will be permitted onto the ice. Helmets are strongly encouraged. Skates must be checked at the Fan Experience Zone at GATE 6 prior to entering the Sleeman Centre concourse for the game, and a baggage ticket will be issued. The skates may be picked up following the game. Tickets for the game can be purchased online HERE.